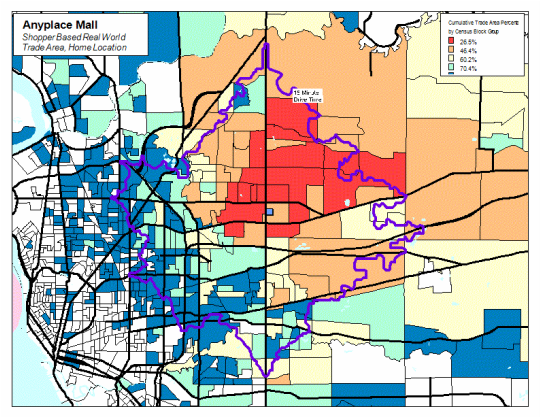 Shopper Based Real World Trade Areas - GEOmarketing Solutions Group Inc.
As a key part of our MallMix initiatives we have been striving to improve our ability to define a mall’s trade area. In the past we have used drive time polygons and concentric circles to identify a trade area. This assumes that everyone within these areas is a customer of the mall, when only some of the customers are residents. Static trade areas take into account only the households that are within those polygons. They miss completely the customers that commute to work near the mall, or travel to school near the mall, or visit the mall as a destination, to shop at a specific store. Just because someone lives within a certain drive time of a mall does not necessarily mean they will shop there. Yet another shortcoming of static trade areas based on drive times and concentric circles is that they are unable to adjust to time of day and day of week changes in customer traffic. We now have a number of new data sources that provide a more accurate and realistic view of the trade area for any mall – in Canada and the U.S. For the first time we can now show where actual shoppers come from to shop at a mall, with the additional ability to show how the trade area evolves over time. For example, the weekday lunch time shoppers are likely different from the afternoon shoppers, and the weekend shoppers are probably not the same as either of those two groups. Call us today to arrange for a Shopper Based Real World Dynamic Trade Area Report for your mall.